Australopithecus (AW-struh-loh-PITH-i-kuhs, /ˌɒstrələˈpɪθᵻkəs, ˌɔː-, -loʊ-/; etymology Latin australis "southern", Greek πίθηκος pithekos "ape"; informal australopithecine or australopith) is an extinct genus of hominins. From paleontological and archaeological evidence, the Australopithecus genus apparently evolved in eastern Africa around 4 million years ago before spreading throughout the continent and eventually becoming extinct somewhat after two million years ago. 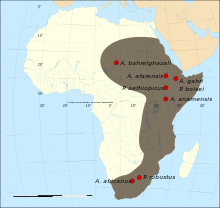 During that time, a number of australopithecine species emerged, including Australopithecus afarensis, A. africanus, A. anamensis, A. bahrelghazali, A. deyiremeda (proposed), A. garhi, and A. sediba. 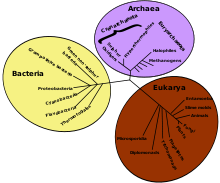 For some hominid species of this time, such as A. robustus and A. boisei, some debate exists whether they constitute members of the same genus. If so, they would be considered 'robust australopiths', while the others would be 'gracile australopiths'. However, if these species do constitute their own genus, they may be given their own name, Paranthropus. Australopithecus species played a significant part in human evolution, the genus Homo being derived from Australopithecus at some time after three million years ago. Among other things, they were the first hominids to show the presence of a gene that causes increased length and ability of neurons in the brain, the duplicated SRGAP2 gene. One of the australopith species eventually became the Homo genus in Africa around two million years ago (e.g. Homo habilis), and eventually modern humans, H. sapiens sapiens. Gracile australopiths shared several traits with modern apes and humans, and were widespread throughout Eastern and Northern Africa around 3.5 million years ago. The earliest evidence of fundamentally bipedal hominids can be observed at the site of Laetoli in Tanzania. This site contains hominid footprints that are remarkably similar to those of modern humans and have been dated to as old as 3.6 million years. The footprints have generally been classified as australopith because that is the only form of prehuman known to have existed in that region at that time. Australopithecus anamensis, A. afarensis, and A. africanus are among the most famous of the extinct hominins. A. africanus was once considered to be ancestral to the genus Homo (in particular Homo erectus). However, fossils assigned to the genus Homo have been found that are older than A. africanus. 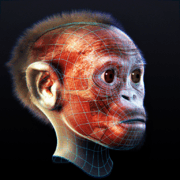 Thus, the genus Homo either split off from the genus Australopithecus at an earlier date (the latest common ancestor being either A. afarensis or an even earlier form, possibly Kenyanthropus), or both developed from a yet possibly unknown common ancestor independently. According to the Chimpanzee Genome Project, the human (Ardipithecus, Australopithecus and Homo) and chimpanzee (Pan troglodytes and Pan paniscus) lineages diverged from a common ancestor about five to six million years ago, assuming a constant rate of evolution. It is theoretically more likely for evolution to happen more slowly, as opposed to more quickly, from the date suggested by a gene clock (the result of which is given as a youngest common ancestor, i.e., the latest possible date of divergence.) However, hominins discovered more recently are somewhat older than the presumed rate of evolution would suggest. 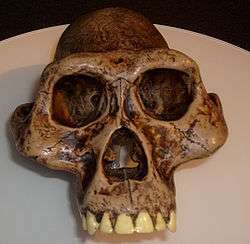 Sahelanthropus tchadensis, commonly called "Toumai", is about seven million years old and Orrorin tugenensis lived at least six million years ago. Since little is known of them, they remain controversial among scientists since the molecular clock in humans has determined that humans and chimpanzees had a genetic split at least a million years later. One theory suggests that the human and chimpanzee lineages diverged somewhat at first, then some populations interbred around one million years after diverging. The brains of most species of Australopithecus were roughly 35% of the size of a modern human brain. Most species of Australopithecus were diminutive and gracile, usually standing 1.2 to 1.4 m (3 ft 11 in to 4 ft 7 in) tall. In several variations is a considerable degree of sexual dimorphism, males being larger than females. According to one scholar, A. Zihlman, Australopithecus body proportions closely resemble those of bonobos (Pan paniscus), leading evolutionary biologists such as Jeremy Griffith to suggest that bonobos may be phenotypically similar to Australopithecus. Furthermore, thermoregulatory models suggest that Australopithecus species were fully hair covered, more like chimpanzees and bonobos, and unlike humans. Modern humans do not appear to display the same degree of sexual dimorphism as Australopithecus did. In modern populations, males are on average a mere 15% larger than females, while in Australopithecus, males could be up to 50% larger than females. New research suggests, however, that australopithecines exhibited a lesser degree of sexual dimorphism than these figures suggest, but the issue is not settled. Opinions differ as to whether the species A. aethiopicus, A. boisei, and A. robustus should be included within the genus Australopithecus, and no current consensus exists as to whether they should be placed in a distinct genus, Paranthropus, which is suggested to have developed from the ancestral Australopithecus line. Until the last half-decade, the majority of the scientific community included all the species shown in the box at the top of this article in a single genus. The postulated genus Paranthropus was morphologically distinct from Australopithecus, and its specialized morphology implies that its behaviour may have been quite different from that of its ancestors, although it has been suggested that the distinctive features of A. aethiopicus, A. boisei, and A. robustus may have evolved independently. The fossil record seems to indicate that Australopithecus is the common ancestor of the distinct group of hominids now called Paranthropus (the "robust australopiths"), and most likely the genus Homo, which includes modern humans. Though the intelligence of these early hominids was likely no more sophisticated than in modern apes, the bipedal stature is the key element that distinguishes the group from previous primates, which were quadrupeds. The morphology of Australopithecus upset what scientists previously believed — namely, that strongly increased brain size had preceded bipedalism. If A. afarensis was the definite hominid that left the footprints at Laetoli, that strengthens the notion that A. afarensis had a small brain, but was a biped. Fossil evidence such as this makes it clear that bipedalism far predated large brains. However, it remains a matter of controversy as to how bipedalism first emerged (several concepts are still being studied). The advantages of bipedalism were that it left the hands free to grasp objects (e.g., carry food and young), and allowed the eyes to look over tall grasses for possible food sources or predators. However, many anthropologists argue that these advantages were not large enough to cause the emergence of bipedalism. A recent study of primate evolution and morphology noted that all apes, both modern and fossil, show skeletal adaptations to erect posture of the trunk, and that fossils such as Orrorin tugenensis indicate bipedalism around six million years ago, around the time of the split between humans and chimpanzees indicated by genetic studies. This suggested that erect, straight-legged walking originated as an adaptation to tree-dwelling. Studies of modern orangutans in Sumatra have shown that these apes use four legs when walking on large, stable branches, and swing underneath slightly smaller branches, but are bipedal and keep their legs very straight when walking on multiple flexible branches under 4 cm diameter, while also using their arms for balance and additional support. This enables them to get nearer to the edge of the tree canopy to get fruit or cross to another tree. The ancestors of gorillas and chimpanzees are suggested to have become more specialised in climbing vertical tree trunks, using a bent hip and bent knee posture that matches the knuckle-walking posture they use for ground travel. This was due to climate changes around 11 to 12 million years ago that affected forests in East and Central Africa, so periods occurred when openings prevented travel through the tree canopy, and at these times, ancestral hominids could have adapted the erect walking behaviour for ground travel. Humans are closely related to these apes, and share features including wrist bones apparently strengthened for knuckle-walking. However, the view that human ancestors were knuckle-walkers is now questioned since the anatomy and biomechanics of knuckle-walking in chimpanzees and gorillas are different, suggesting that this ability evolved independently after the last common ancestor with the human lineage. Further comparative analysis with other primates suggests that these wrist-bone adaptations support a palm-based tree walking. Radical changes in morphology took place before gracile australopiths evolved; the pelvis structure and feet are very similar to modern humans. The teeth have small canines, but australopiths generally evolved a larger postcanine dentition with thicker enamel. Most species of Australopithecus were not any more adept at tool use than modern nonhuman primates, yet modern African apes, chimpanzees, and most recently gorillas, have been known to use simple tools (i.e. cracking open nuts with stones and using long sticks to dig for termites in mounds), and chimpanzees have been observed using spears (not thrown) for hunting. For a long time, no known stone tools were associated with A. afarensis, and paleoanthropologists commonly thought that stone artifacts only dated back to about 2.5 million years ago. However, a 2010 study suggests the hominin species ate meat by carving animal carcasses with stone implements. This finding pushes back the earliest known use of stone tools among hominins to about 3.4 million years ago. Some have argued that A. garhi used stone tools due to a loose association of this species and butchered animal remains. In a 1979 preliminary microwear study of Australopithecus fossil teeth, anthropologist Alan Walker theorized that robust australopiths were largely frugivorous. Australopithecus species mainly ate fruit, vegetables, small lizards, and tubers. Much research has focused on a comparison between the South African species A. africanus and Paranthropus robustus. Early analyses of dental microwear in these two species showed, compared to P. robustus, A. africanus had fewer microwear features and more scratches as opposed to pits on its molar wear facets. These observations have been interpreted as evidence that P. robustus may have fed on hard and brittle foods, such as some nuts and seeds. More recently, new analyses based on three-dimensional renderings of wear facets have confirmed earlier work, but have also suggested that P. robustus ate hard foods primarily as a fallback resource, while A. africanus ate more mechanically tough foods. In 1992, trace-element studies of the strontium/calcium ratios in robust australopith fossils suggested the possibility of animal consumption, as they did in 1994 using stable carbon isotopic analysis. In 2005, fossils of animal bones with butchery marks dating 2.6 million years old were found at the site of Gona, Ethiopia. Fossil evidence indicates meat consumption by at least three species of hominins occurring around 2.6-2.5 Mya: A. africanus, A. garhi, and P. aethiopicus. In 2010, fossils of butchered animal bones dated 3.4 million years old were found in Ethiopia, close to regions where australopith fossils were found. 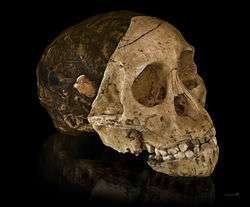 The type specimen for genus Australopithecus was discovered in 1924, in a lime quarry by workers at Taung, South Africa. The specimen was studied by the Australian anatomist Raymond Dart, who was then working at the University of the Witwatersrand in Johannesburg. The fossil skull was from a three-year-old bipedal primate that he named Australopithecus africanus. The first report was published in Nature in February 1925. Dart realised that the fossil contained a number of humanoid features, and so, he came to the conclusion that this was an early ancestor of humans. Later, Scottish paleontologist Robert Broom and Dart set about to search for more early hominin specimens, and at several sites they found more A. africanus remains, as well as fossils of a species Broom named Paranthropus (which would now be recognised as P. robustus). Initially, anthropologists were largely hostile to the idea that these discoveries were anything but apes, though this changed during the late 1940s. The first australopithecine discovered in eastern Africa was a skull belonging to an A. boisei that was excavated in 1959 in the Olduvai Gorge in Tanzania by Mary Leakey. 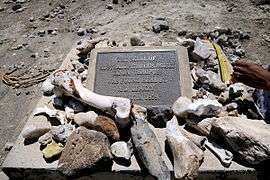 Since then, the Leakey family have continued to excavate the gorge, uncovering further evidence for australopithecines, as well as for Homo habilis and Homo erectus. The scientific community took 20 years to widely accept Australopithecus as a member of the family tree. Then, in 1997, an almost complete Australopithecus skeleton with skull was found in the Sterkfontein caves of Gauteng, South Africa. It is now called "Little Foot" and it is probably around three million years old. It was named Australopithecus prometheus which has since been placed within A. africanus. Other fossil remains found in the same cave in 2008 were named Australopithecus sediba, which lived 1.9 million years ago. A. africanus probably evolved into A. sediba, which some scientists think may have evolved into H. erectus, though this is heavily disputed. ↑ David A. Raichlen; Adam D. Gordon; William E. H. Harcourt-Smith; Adam D. Foster; Wm. Randall Haas Jr (2010). Rosenberg, Karen, ed. "Laetoli Footprints Preserve Earliest Direct Evidence of Human-Like Bipedal Biomechanics". PLoS ONE. 5 (3): e9769. Bibcode:2010PLoSO...5.9769R. doi:10.1371/journal.pone.0009769. PMC 2842428 . PMID 20339543. 1 2 Bower, Bruce (May 20, 2006). "Hybrid-Driven Evolution: Genomes show complexity of human-chimp split". Science News. 169 (20): 308–309. doi:10.2307/4019102. JSTOR 4019102. 1 2 Beck, Roger B.; Linda Black; Larry S. Krieger; Phillip C. Naylor; Dahia Ibo Shabaka (1999). World History: Patterns of Interaction. Evans ton, IL: McDougal Littell. ISBN 0-395-87274-X. ↑ Zihlman AL, Cronin JE, Cramer DL, Sarich VM (1978). "Pygmy chimpanzee as a possible prototype for the common ancestor of humans, chimpanzees and gorillas". Nature. 275 (5682): 744–6. Bibcode:1978Natur.275..744Z. doi:10.1038/275744a0. PMID 703839. ↑ Griffith, Jeremy (2013). Freedom Book 1. Part 8:4G. WTM Publishing & Communications. ISBN 978-1-74129-011-0. Retrieved 28 March 2013. ↑ David-Barrett, T.; Dunbar, R.I.M. (2016). "Bipedality and Hair-loss Revisited: The Impact of Altitude and Activity Scheduling". Journal of Human Evolution. 94: 72–82. doi:10.1016/j.jhevol.2016.02.006. ↑ Thorpe, SK; Holder, RL; Crompton, RH. (2007). "Origin of human bipedalism as an adaptation for locomotion on flexible branches". Science. 316 (5829): 1328–31. Bibcode:2007Sci...316.1328T. doi:10.1126/science.1140799. PMID 17540902. ↑ Richmond, BG; Begun, DR; Strait, DS (2001). "Origin of human bipedalism: The knuckle-walking hypothesis revisited". American Journal of Physical Anthropology. Suppl 33: 70–105. doi:10.1002/ajpa.10019. PMID 11786992. 1 2 Kivell, TL; Schmitt, D. (Aug 2009). "Independent evolution of knuckle-walking in African apes shows that humans did not evolve from a knuckle-walking ancestor". Proceedings of the National Academy of Sciences of the United States of America. 106 (34): 14241–6. Bibcode:2009PNAS..10614241K. doi:10.1073/pnas.0901280106. PMC 2732797 . PMID 19667206. ↑ Lovejoy, C. O. (1988). "Evolution of Human walking". Scientific American. 259 (5): 82–89. doi:10.1038/scientificamerican1188-118. PMID 3212438. ↑ McHenry, H. M. (2009). "Human Evolution". In Michael Ruse; Joseph Travis. Evolution: The First Four Billion Years. Cambridge, Massachusetts: The Belknap Press of Harvard University Press. pp. 261–265. ISBN 978-0-674-03175-3. ↑ McPherron, Shannon P.; Zeresenay Alemseged; Curtis W. Marean; Jonathan G. Wynn; Denne Reed; Denis Geraads; Rene Bobe; Hamdallah A. Bearat (2010). "Evidence for stone-tool-assisted consumption of animal tissues before 3.39 million years ago at Dikika, Ethiopia". Nature. 466 (7308): 857–860. Bibcode:2010Natur.466..857M. doi:10.1038/nature09248. PMID 20703305. ↑ Billings, Tom. "Humanity's Evolutionary Prehistoric Diet and Ape Diets--continued, Part D)". Archived from the original on 8 January 2007. Retrieved 2007-01-06. 1 2 Grine FE (1986). "Dental evidence for dietary differences in Australopithecus and Paranthropus - a quantitative-analysis of permanent molar microwear". Journal of Human Evolution. 15 (8): 783–822. doi:10.1016/S0047-2484(86)80010-0. ↑ Scott RS, Ungar PS, Bergstrom TS, Brown CA, Grine FE, Teaford MF, Walker A (2005). "Dental microwear texture analysis shows within-species diet variability in fossil hominins". Nature. 436 (7051): 693–695. Bibcode:2005Natur.436..693S. doi:10.1038/nature03822. PMID 16079844. ↑ Billings, Tom. "Comparative Anatomy and Physiology Brought Up to Date--continued, Part 3B)". Archived from the original on 15 December 2006. Retrieved 2007-01-06. ↑ Nature. "Evidence for Meat-Eating by Early Humans". ↑ Nature. "Butchering dinner 3.4 million years ago". 1 2 Lewin, R. (1999). "The Australopithecines". Human Evolution: An Illustrated Introduction. Blackwell Science. p. 112. ↑ Lewin, R. (1999). "The Australopithecines". Human Evolution: An Illustrated Introduction. Blackwell Science. p. 113. ↑ Celia W. Dugger; John Noble Wilford (April 8, 2010). "New Hominid Species Discovered in South Africa". The New York Times. Barraclough, G. (1989). Stone, N., ed. Atlas of World History (3rd ed.). Times Books Limited. ISBN 0-7230-0304-1. .
Leakey, Richard (1994). The Origins of Human Kind. New York: BasicBooks. ISBN 0-465-03135-8. .
White, Tim D.; WoldeGabriel, Giday; Asfaw, Berhane; Ambrose, S; Beyene, Y; Bernor, RL; Boisserie, JR; Currie, B; Gilbert, H; Haile-Selassie, Y; Hart, WK; Hlusko, LJ; Howell, FC; Kono, RT; Lehmann, T; Louchart, A; Lovejoy, CO; Renne, PR; Saegusa, H; Vrba, ES; Wesselman, H; Suwa, G (2006). "Asa Issie, Aramis and the Origin of Australopithecus". Nature. 440 (7086): 883–889. Bibcode:2006Natur.440..883W. doi:10.1038/nature04629. PMID 16612373. .
Gibbons, Ann (2006). The first human. New York: Doubleday. p. 306. ISBN 978-0385512268. Reader, John (2011). Missing links: in search of human origins. New York: Oxford University Press. p. 538. ISBN 978-0-19-927685-1. Tattersall, Ian (2012). Masters of the Planet, the search for our human origins. Palgrave-Macmillan. pp. 1–79. ISBN 978-0-230-10875-2. Wikimedia Commons has media related to Australopithecus.